Surely one hour a day is not enough? 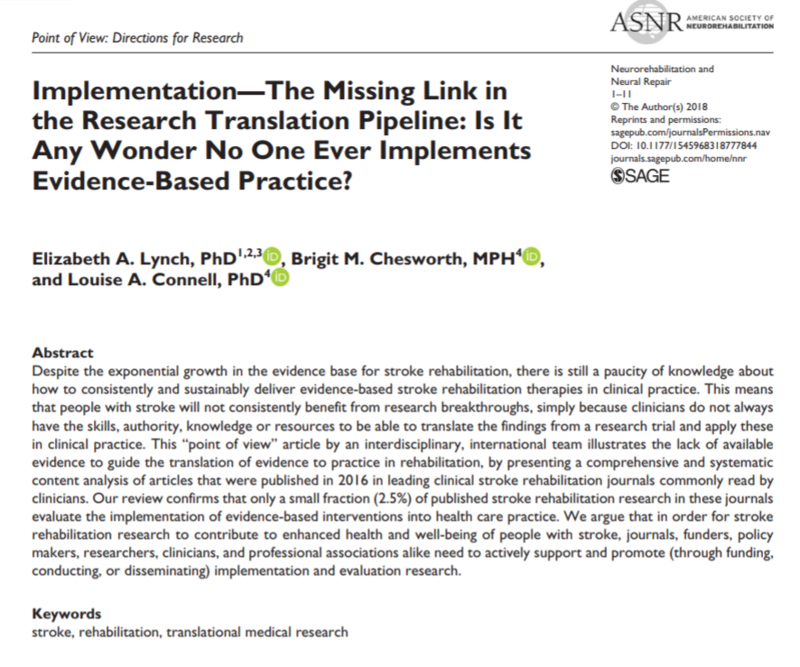 It was this exact same thought I had 30 odd years later as a new graduate physiotherapist that sparked my interest in research and led me down the path of researching different models of providing more therapy to people after stroke. Our recently published Cochrane review provides further robust evidence that group circuit class therapy improves walking ability after stroke. It may also help stroke survivors increase their daily physical activity and improve their fitness – both important factors for staying healthy and reducing risk of future stroke. But back to the beginning. What is circuit class therapy? In a nutshell, circuit class therapy is providing rehabilitation (physiotherapy or occupational therapy) in a group environment. It can be targeted at either improving arm or walking function, but most of the research has focused on circuit class therapy for improving walking ability. We know that lots of active practice of standing up, balance and walking is vital to drive recovery of mobility after stroke. Traditionally, this is provided in sessions with a therapist on a one-to-one basis. Circuit class therapy involves providing the same guided practice of functional tasks, but in a semi-supervised group environment. 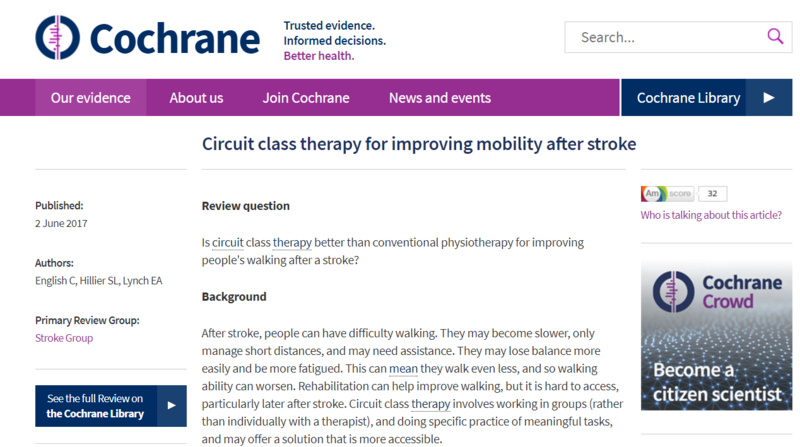 In this Cochrane review we combined all available studies that have examined the effectiveness of circuit class therapy to improve walking ability after stroke. It was an update of an earlier review published in 2010. In the updated review, we pooled 17 trials involving 1297 participants. Most (13/17) trials provided circuit class therapy to people after discharge from hospital, while four examined the effectiveness of circuit class therapy provided in hospital settings. Overall, we found that, compared to alternative interventions (including usual care, education, arm retraining or stretches), participants receiving circuit class therapy had improved walking ability (could walk further, faster and with greater independence) and based on some outcome measures, had better ability to balance. 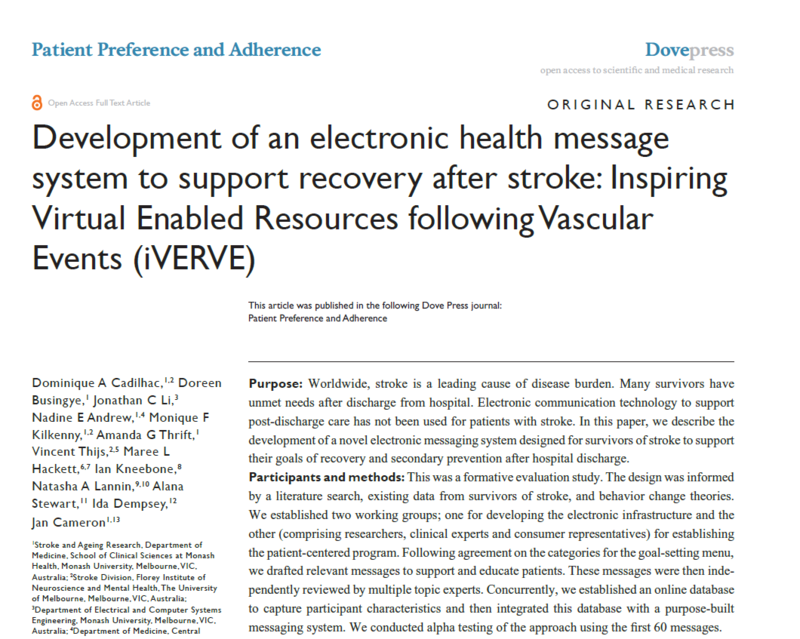 These results remained similar when circuit class therapy was provided earlier and later after stroke and across small (<100 participants) and large trials. Unfortunately, few studies collected follow-up data after the end of the intervention, so we have little information about whether the effects last. While the ability to walk further, faster and more independently is of real importance to stroke survivors, we know that cardiorespiratory fitness and levels of daily physical activity are two of the most powerful drivers of health generally, and risk of cardiovascular disease and stroke more specifically. While only a couple of studies measured it, there is some evidence that circuit class therapy could improve cardiorespiratory fitness and physical activity (daily step counts), but more research on this is needed before we can be sure. 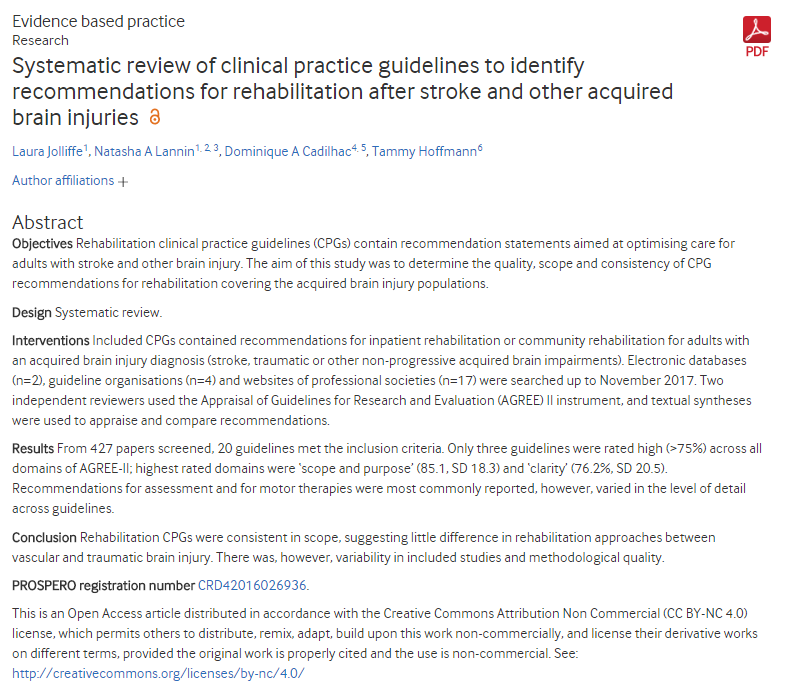 Providing circuit class therapy to people in inpatient rehabilitation centres early after stroke may also reduce length of hospital stay by about 16 days. We have to be careful interpreting this result as there were big differences between studies. However, reducing time in hospital, even by a small amount is good for both people with stroke and to save costs in the health care system. Circuit class therapy is not without risks. Our review found a slightly higher rate of falls in circuit class therapy compared to comparison interventions. This is probably not surprising given the semi-supervised nature of circuit class therapy. While every effort must be made to reduce fall risk, the risks must be weighed up against the benefits from increased activity. For a very interesting read on balancing the tension between falls risk and activity see Growden et al JAMA Intern Med. 2017;177(6):759-760. Most importantly, this review showed that people can improve their walking ability, even years after their stroke. Physiotherapists and occupational therapists working with people after stroke should consider using circuit class therapy in their practice. 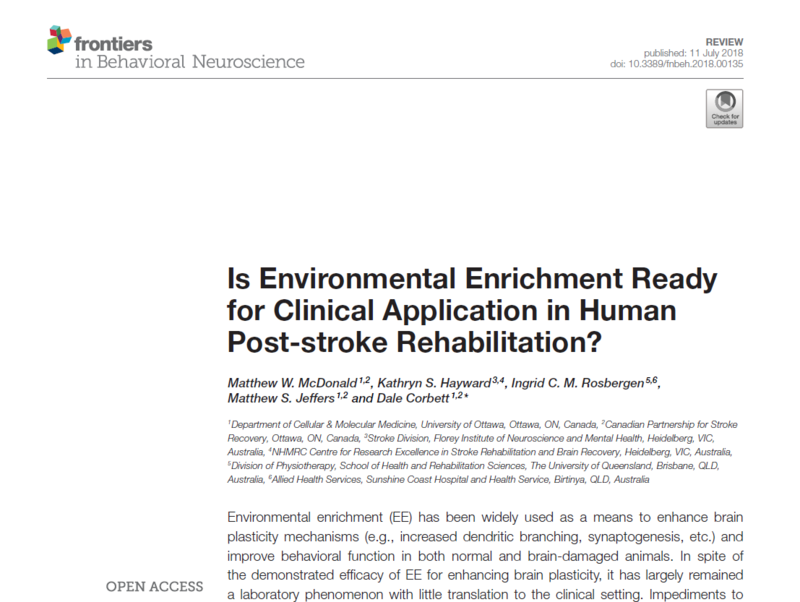 Is Environmental Enrichment Ready for Clinical Application in Human Post-stroke Rehabilitation?